In order to constantly improve analytical and testing capabilities in the fields, improve professional skill for testers, in 3 days from 9 to April 11, 2019 in Hanoi, the technicians of Ha Nam Zhongbiao Testing Services Co., Ltd (belonging to Zhongbiao Group, China) and staff of the National Center for Veterinary Diagnosis supported to transfer African swine cholera epidemic testing technique by Real-time PCR method to the technicians of VinaCert Laboratory 1; pesticides residues determining method in agricultural products (fresh vegetables and fruits). 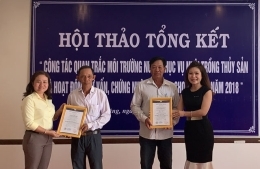 Within the framework of the program "Seminar on reviewing the water environment surveillance for aquaculture, consulting and certifying VietGAP for Cooperative in 2018" took place on 11 January 2019 in Soc Trang , on behalf of VinaCert, Mrs. Nguyen Thi Hue, Director of VinaCert Branch in Can Tho, handed certificate of (VietGAP) conformity certification of tiger prawn and white leg shrimp farming process for Chien Thang Cooperative Group and Hoa Tu 2 Clean Shrimp Cooperative. 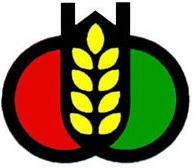 Food national technical regulation conformity certification (Food Safety Institute). Animal feed national technical regulation conformity certification (designation code: 01-0010-BNN). Plant protection products national technical regulation conformity certification (designation code 01-0010-BNN). Certificate of Conformity for Aquaculture feed production facilities, Aquatic breeds facilities and Aquatic breeds facilities for aquaculture (designation code: 01-0010-BNN). 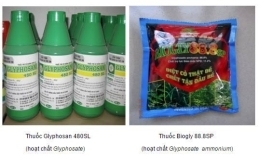 Crop production VietGAP certification (designation code: VietGAP-TT-13-02). 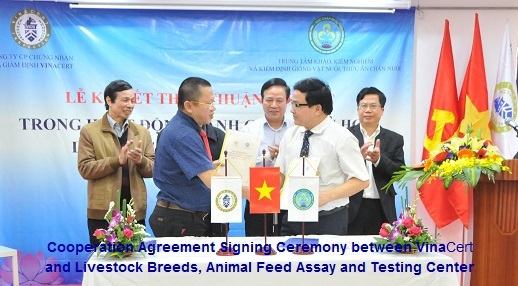 Animal husbandry VietGAP certification (designation code: VietGAP-CN-12-01). Aquaculture VietGAP certification (designation code: VietGAP-TS-13-08). Plant protection product testing laboratory (designation code LAS-NN 92). Animal feed testing laboratory (designation code LAS NN-01). Conformity Certification of Veterinary medicine 01 - 187: 2018/BNNPTNT. Inorganic fertilizer testing organization (Decision No. 4352/QD-BCT). Professional Experience: VinaCert is proud to be the first certification organization established in Vietnam operating under Law on Enterprises, VinaCert is always proactive and flexible in all legal procedures to minimize cost and time for customers. Auditor team consists of highly qualified, experienced and trained under IRCA international standards professionals, meeting ISO 19011 requirements. Currently,VinaCert has 35 auditors and 43 technical experts. 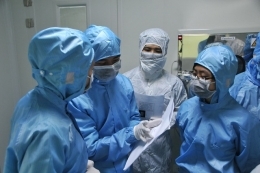 Analyst team consists of experienced individuals in the field of analysis and testing, specialized trained to meet the requirements of ISO/IEC 17025 – General standard for testing activities. 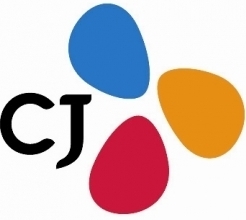 The current number of analysts of VinaCert is 63. Facilities: The system of VinaCert's branches spreads throughout State-governed central cities of Vietnam: Hanoi, Ho Chi Minh City, Hai Phong, Da Nang City, Can Tho City - provides certification services to clients anywhere, help clients save costs. Human Resources: VinaCert human resources are young, enthusiastic, highly experienced and formally trained: the current number of VinaCert staffs is 200. 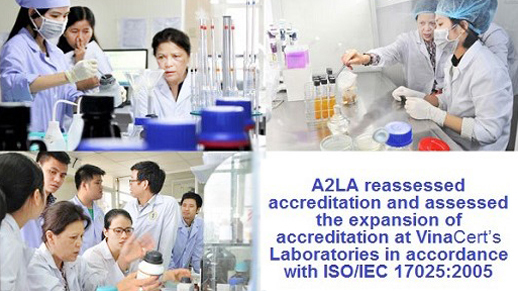 VinaCert is the only organization in Vietnam accredited by International Accreditation organization A2LA - United States – to be adequately competent according to ISO/IEC 17025: 2017 for testing activities. VinaCert is one of the only two certification organizations established in Vietnam to be directly internationally acredited for certification activities (international accreditation organization JAS-ANZ (Australia, New Zealand) accredited VinaCert’s certification activities). 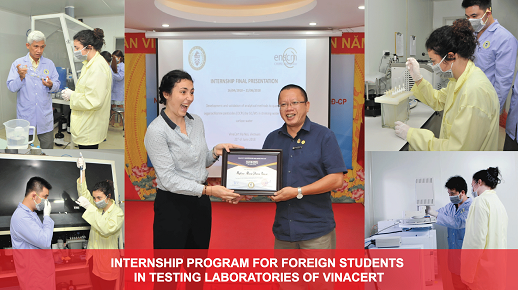 VinaCert is the first private-sector enterprise authorized by Vietnam state to perform quality inspection of imported goods. Fast, accurate, convenient, modern VinaCert has goods inspection registration reception system working anytime, anywhere via the online software at http://vicb.vinacert.vn.